Cactus Plants | Cool Kid Facts . You probably know the cactus as a spiky green plant that grows in the desert. That may be true, but there’s so much more to learn about cacti (that’s the word for more than one cactus plant)! The cactus is a type of plant called a succulent. That means that it can store water in its stems, roots, and leaves. Even if it doesn’t rain for a long time, the cactus still has water saved up to help it grow. Thanks to its ability to store water, the cactus can live for over a year without rain! What does a cactus plant look like? 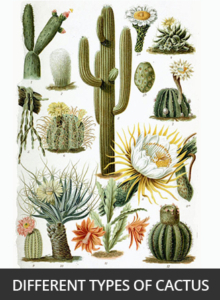 There are about 2000 types of cacti, and they come in different shapes, sizes, and colors. Green may be the most common color for cacti, but they can also be bluish or brown-green. Some cactus plants are very round, and others are flat like a pancake. Some are even shaped like snakes or starfish. A cactus plant can be very small or very big. 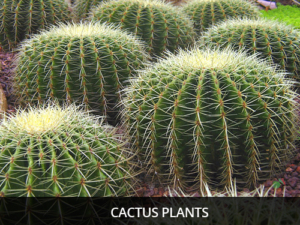 The largest type of cacti can grow to be 66 feet tall and weigh up to 4800 pounds. That’s as heavy as a car! Although you might think of a cactus as an ugly plant covered in spikes, it actually grows big, beautiful flowers too. Cactus flowers can be yellow, red, pink, white, orange, or blue. Some cactus flowers bloom for only a day, while others last for weeks. Many of these flowers are nocturnal, meaning they bloom only at night. Of course, the cactus does have spikes too, but these are technically called spines. The cactus plant has spines instead of leaves, and these spines help the cactus plant survive. The sharp spines protect cacti from animals and birds. They also help keep the cactus plant’s stored water from escaping. The cactus plant’s spines may not be pretty to look at, but they sure are important! If you thought the answer to this question was, “The desert,” you’re right! Most cacti grow in the desert or in very dry areas because they like dry, rocky soil. However, some cactus plants have been found in the rainforest and in northern countries like Canada. The states that are most known for cacti are Arizona, California, and Texas. These states have deserts and national parks where many cactus plants grow. People visit from all over just to see the cacti, especially when the flowers are blooming between the months of March and May. -You can probably tell by now that the cactus plant has a lot of special tricks to help it survive in the desert. 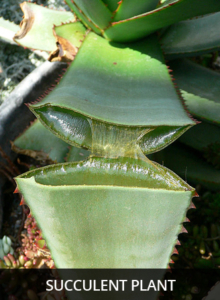 For example, the cactus has waxy skin that helps it hold in water. -The water inside a cactus plant is much thicker than the water you normally see. It may not look very tasty, but it’s safe for people to drink. In fact, drinking cactus water has saved the lives of people traveling through the desert! So yes, the cactus plant is spiky, (usually) green, and grows in the desert. But it’s also a really unique plant with all kinds of special tricks to help it survive in the desert. Plus, it’s a useful plant that grows fruit, can be used to make different items, and has drinkable water that has saved lives!